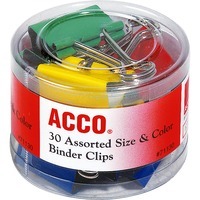 Reusable binder clips securely fasten stacks of paper from 2 to 225 sheets depending on size. Tempered steel construction provides an extra strong hold and the wire arms resists rust and scratching. Binder clips spring back to original shape after use. 30 per pack 12 mini, 12 small and 6 medium.